Dew Drop & Hop To It, Frogman Bronze sculpture pair. A wonderful Frogman Bronze pair featuring two exquisite frogs that perfectly complement each other. The delicate Dew Drop climbs a reed shared with little ladybirds. 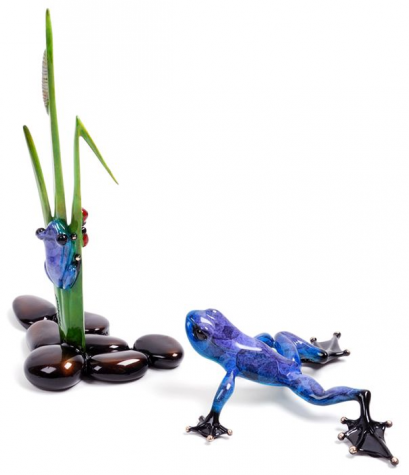 Hop To It, in the same stunning blue patina, is the perfect companion to his smaller friend. Size: 6" X 5" X 2.5"